Box and Whiskers plots are very helpful in interpreting the distribution of data. Each box and whiskers item represents a set of values and displays statistical information like minimum, maximum and median values, upper and lower quartiles, outliers and optionally - average value. A box and whiskers series with custom date time values. This chart lets you compare the statistical parameters of several datasets produced at different moments in time. Box and whiskers plots are very helpful in interpreting distribution of data. Each box and whiskers item represents a set of values and displays statistical information about it, such as minimum, maximum and median values, upper and lower quartiles, outliers and, optionally - average value. 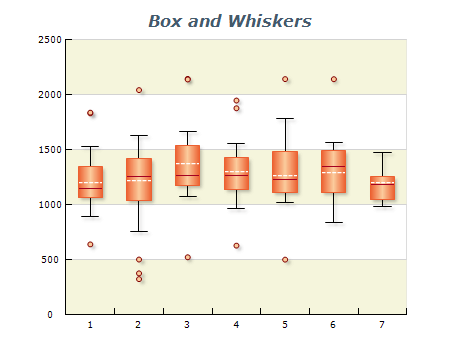 A box and whiskers series, designed to summarize overall distribution of data in the chart.